Shuttle-Derived Launch Vehicle, or simply Shuttle-Derived Vehicle (SDV), is a term describing one of a wide array of concepts that have been developed for creating space launch vehicles from the components, technology and infrastructure of the Space Shuttle program. SDVs have also been part of NASA's plans several times in the past. In the late 1980s and early 1990s, NASA formally studied a cargo-only vehicle, Shuttle-C, that would have supplemented the crewed Space Shuttle in orbiting payloads. In 2005, NASA decided to develop the Ares I and Ares V launch vehicles, based in part on highly modified Shuttle components to replace the Space Shuttle, and enable exploration of the Moon and Mars. The agency also studied a third such vehicle, the Ares IV. As of April 2011, NASA's replacement vehicle for the Space Shuttle is an SDV, the Space Launch System and multiple commercial vehicles. Over the course of the 2010 two different commercial vehicles were developed that use man-rated heavy lift launcher. In the meantime NASA has continued to use the Russian Soyuz, which it also used during the Shuttle program as part of the International Space Station program. Beginning in 1987, NASA actively pursued development of a vehicle called the Shuttle-C, an uncrewed cargo-only launch vehicle. Shuttle-C would have replaced the winged Space Shuttle Orbiter with an expendable cargo module. The module would have no wings, would not carry crew, and would not be recovered. It was expected to carry up to 150,000 pounds (68,000 kg) of payload to low-Earth orbit, compared to the Shuttle's nominal maximum of 65,000 pounds (29,000 kg). Budget pressures, caused in large part by the Space Station Freedom project, resulted in the official cancellation of Shuttle-C in 1990. The National Launch System was a study authorized in 1991 by President George H. W. Bush to outline alternatives to the Space Shuttle for access to Earth Orbit. The largest of three proposed vehicles was designated NLS-1 and used for its core stage a modified Space Shuttle External Tank with four Space Transportation Main Engines (STMEs) attached to the bottom of the tank. A payload or second stage would fit atop the core stage, and two detachable Solid Rocket Boosters would be mounted on the sides of the core stage. Larger rockets than NLS-1 were contemplated, using multiples of the NLS-1 core stage. A recent proposal put forward as alternative to the NASA Ares vehicles is the "Direct Shuttle Derivative" or DIRECT architecture (unrelated to the "Mars Direct" plan), made by a grassroots group of engineers and other spaceflight enthusiasts. As of May 2009, DIRECT revolves a notional series of vehicles, dubbed "Jupiter", that would use an external tank (ET) derived core stage powered by three or four Space Shuttle Main Engines (SSMEs), plus a pair of standard four-segment SRBs. All versions of Jupiter would use this "common core"; larger variants would include an upper stage. DIRECT's proponents, which the group says includes dozens of NASA and industry personnel working anonymously, argue that development costs of this vehicle would be significantly lower than those for the Ares I / Ares V because of Jupiter's greater commonality with the existing Space Shuttle and its proven, human-rated systems. Further, because the same common core design would be used for both crew and cargo launches, savings would be realized over the dissimilar Ares I and Ares V vehicles through economies of scale, streamlined production and processing, and the like. The DIRECT Team claims that two Jupiter launches would be capable of exceeding NASA's delivered payload mass targets for an Ares I / Ares V lunar mission. The group presented its concept to the Review of United States Human Space Flight Plans Committee at a public hearing on 17 June 2009 in Washington, D.C. In June 2009 at the same public hearing of the Review of United States Human Space Flight Plans Committee, Shuttle Program Manager John Shannon unveiled a preliminary concept for a new "side-mount" variant SDV. NASA had begun studying this as an alternate for the Constellation program. This concept would be somewhat similar to the Shuttle-C, but with the Shuttle Orbiter replaced by a keel and boattail structure permanently affixed to the ET (as opposed to the detachable cargo-carrier on Shuttle-C). Three SSMEs would be mounted in the boattail, essentially a simplified Orbiter boattail, and a large expendable fairing would encapsulate the payload. The entire vehicle, including SSMEs, would be discarded after launch. Shannon presented the concept for both cargo-only operation, and crewed missions using the Orion spacecraft and its launch escape system. While requiring far less development than the Ares vehicles, the basic configuration of the vehicle would in a 2-launch lunar architecture be less capable than the currently envisioned Ares I and Ares V mission scenario. As part of the Mars Direct plan, Mars exploration advocate Robert Zubrin and other baselined an "inline" SDV concept developed by engineers at NASA and Martin Marietta. The rocket consisted of a large upper stage and payload shroud mounted on top of the Space Shuttle external tank, and the Orbiter replaced by a simple engine pod. The rocket would launch crews and vehicles directly to Mars. The term "Mars Direct" reflected the idea of launching crews and habitats directly to Mars, without assembly or significant loiter in low Earth orbit. NASA's planned Ares V vehicle would superficially resemble this vehicle due to its "inline" setup, although the Mars Direct Ares used side-mounted Space Shuttle Main Engines and a core with the Shuttle External Tank's diameter for greater commonality with Space Shuttle infrastructure. In 2005, NASA decided to pursue the design and construction of two new launchers, both based on technology and infrastructure developed for the US Space Shuttle program. These launchers would replace the Space Shuttle and supply the launch services necessary to fulfill the Vision for Space Exploration. NASA has given the name "Project Constellation" for the manned Crew Launch Vehicle project. The Ares I, to be used for crew launch, was to use as its first stage a solid rocket derived from the Space Shuttle Solid Rocket Booster (SRB). Whereas the Shuttle SRBs used four segments of solid propellant, the Ares I first stage would have used five. The shape of the central bore of each propellant segment was going to be modified to produce a faster burn. The Ares I would have been topped by a new second stage burning liquid oxygen and liquid hydrogen. The unmanned Ares V vehicle, to be used to loft equipment for lunar sortie or lunar outpost flights into orbit to be met by human crews launched by the Ares I, superficially resembles many of the earlier proposed "inline" SDV concepts. NASA also has proposals of using the Ares V as the main booster to launch the manned Orion Asteroid Mission to an orbiting Near-Earth Asteroid. It consists of a cryogenic liquid hydrogen (LH2) and liquid oxygen (LOX) center stage flanked by two modified SRBs, topped by a new second stage based on the S-IVB stage of the Saturn V rocket. Previous "inline" SDV concepts, however, envisioned extensive use of Shuttle components such as the existing External Tank, or a "stretched" version thereof, as well as the Shuttle's existing main engines. The Ares V will use stretched five or "five-point-five"-segment versions of the SRBs; a new, larger tank using Shuttle External Tank construction and insulation technology; and newer, cheaper expendable rocket engines (the Pratt & Whitney Rocketdyne RS-68 engine, identical to those used on the Delta IV EELV) located at the base of the new tank. NASA briefly studied a third, crew-capable, launch vehicle concept, called Ares IV, which would use the Ares V first stage core and side-mounted SRBs, but with the planned Ares I second stage atop that to carry the Orion crew vehicle. Advantages over the Ares I would probably include reduced development cost and time, common launch pad infrastructure and providing more than adequate lift for the Orion, while disadvantages would include increased per-launch cost over the use of a single SRB for the first stage. According to NASA, potential uses of the Ares IV would have included sending the Orion spacecraft on early "shakeout" missions into lunar orbit only, as well as testing high-speed "skip reentries" in which the capsule would skip in the Earth's atmosphere before landing, rather than making a relatively direct descent. 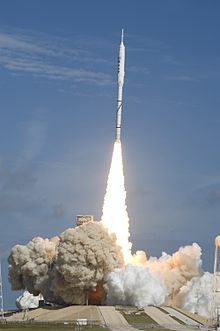 Ares IV was an alternative launch vehicle for NASA's Constellation program suggested by the Augustine Commission. Ares V Lite was a scaled down Ares V. It would use five RS-68 engines and two five-segment SRBs and have a low Earth orbit payload of approximately 140 metric tons (309,000 lb). If chosen, Ares V Lite would replace the Ares V and Ares I launchers. One Ares V Lite version would be a cargo lifter like Ares V and the second version would carry astronauts in the Orion spacecraft. The NASA Authorization Act of 2010 envisions the transformation of the Ares I and Ares V vehicle designs into a Heavy Lift Launch Vehicle, the Space Launch System, both for crew and cargo. It is to be upgraded over time with more powerful versions. The initial capability of the core elements, without an upper stage, should be for between 70 tons and 100 tons into LEO in preparation for transit for missions beyond low-Earth orbit. With the addition of integrated upper Earth departure stage the total lift capability of the Space Launch System should be 130 tons or more. A proposal put forth by ATK and Astrium was to use a five-segment version of the Space Shuttle Solid Rocket Booster as a first stage and a liquid-core first stage of an Ariane 5 as the second stage of a proposed rocket named Liberty. Such a design would cut costs and development time by using already-proven technologies. Liberty would have been 90 meters in length with a projected capability of carrying 20 metric tonnes to low earth orbit. It was projected that this rocket would be flight-capable by 2013 and human-certified by 2015. Some of the potential crew vehicles were being developed with funds from the Commercial Crew Development program. However, Liberty was not among the vehicles selected for funding announced on August 3, 2012 under the Commercial Crew Integrated Capacity program. In May 2016, Orbital ATK revealed their plans for the Next Generation Launcher, including the configuration and the intended business case. Next Generational Launcher was to consist of Space Shuttle-derived solid stages with a cryogenic upper stage provide by Blue Origin. In April 2018, Orbital ATK announced that Next Generation Launcher would be named Omega. Additionally, they revealed the selection of the RL-10C engine over Blue Origin's BE-3U competitor. ^ "Ares: NASA's New Rockets Get Names". NASA. June 30, 2006. Retrieved November 22, 2006. ^ Malik, Tariq (30 June 2006). "NASA Names Rockets for Moon and Mars Missions". Space.com. Retrieved 2006-11-22. ^ Borenstein, Seth for Associated Press. "NASA manager pitches a cheaper return-to-moon plan". USA Today, June 30, 2009. ^ Klotz, Irene (24 June 2009). "NASA readies Plan B for moon rockets". msnbc.com. Retrieved 2009-06-30. ^ "Shuttle-Derived Heavy Lift Launch Vehicle". NASA, June 17, 2009. ^ Berger, Brian (20 January 2006). "CEV Makeover: NASA Overhauls Plans for New Spaceship". Space.com. Retrieved 2006-11-22. ^ "More Powerful Vehicle 'No Threat' To Launcher". flightglobal.com. 16 January 2007. Retrieved 2007-01-26. ^ Berger, Brian (26 January 2007). "NASA Studies Early Moon Shot for New Space Capsule". Space.com. Retrieved 2007-01-26. ^ a b Augustine Committee 2009, pp. 38, 64-67, 80. ^ "New rocket could lift astronauts". BBC News. 8 February 2011. ^ "Boeing, SpaceX and Sierra Nevada Win CCiCAP Awards". Space News. Archived from the original on 2013-01-04. Retrieved 2012-08-03. ^ Clark, Stephen (27 May 2016). "Details of Orbital ATK's proposed heavy launcher revealed". Spaceflight Now. ^ Irene Klotz (24 May 2016). "Orbital planning new rocket to compete for U.S. military launches". Reuters. Yahoo Finance. ^ "Orbital ATK Twitter". Twitter. 17 April 2018. Retrieved 17 April 2018. This page was last edited on 7 January 2019, at 23:51 (UTC).